I changed my college major from Anthropology to American History when I discovered that field work didn’t include air-conditioned hotel rooms with Diet Coke in the fridge. But American History didn’t offer many career paths; you either made it or taught it, and since the latter required I also coach athletics, which wasn’t in my skill bank, I was out of luck there too. So I hitched my wagon to the wheels of government, and, like “the man who came to dinner,” stayed on for over three decades. Cutting-edge legislation, essential public services, policy development. Those weren’t me. No, I wound up in human resources analyzing jobs. And I loved it. Behind the usual complaints about their bosses, most people take pride in how they earn a living. Ask them a few basic questions about what they do, and you find yourself taking pages and pages of notes. More times than not, somewhere in that exchange, they tell you how unique their job is from all the others. At the time, my job was to see the similarities in jobs so I could match individual positions with other jobs that were essentially the same. But in my writing, it’s the distinctions in what people do for a living that fascinate me and infiltrate my plots to the point of my main characters’ occupations almost becoming secondary characters. I’m also an analyst at heart and by trade. That tendency is the backbone of the cozy mysteries I have now added to my repertoire. On the personal front, I have a BA in American History from the University of Iowa and an MA in the same area from Drake University. I am married to the man I met in sensitivity training when we were both dormitory floor advisers at the University of Iowa. We have two grown children and eight grandchildren. I am now a resident of Florida, where I live in the shadow of the Mouse. Part of the year, I also live in my home state of Iowa. I am pleased to say I am a fifteen-year breast cancer survivor. Two years ago, I underwent surgery to replace my left knee. My right knee was replaced seven years ago. Besides the support of family and friends, the one thing that has kept me going throughout these experiences has been my writing. 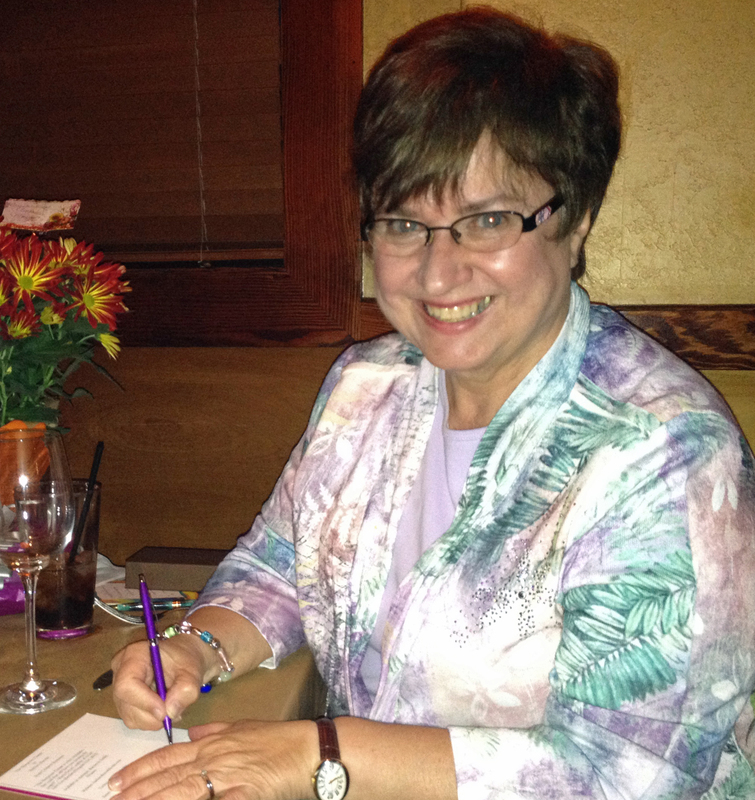 I am a member of Romance Writers of America and three of its chapters. What personal information is collected from people who visit this blog or website? When commenting or registering on this site, as appropriate, you may be asked to enter your name, email address, website address or other details to help you with your experience. When do is information collected? Information is collected from you when you fill out a form or enter information on this site, including when you leave a comment. How do is information used? • To send periodic emails regarding events, products and service. • To follow up with you after correspondence (i.e. comments or email inquiries). Compile aggregate data about site traffic and site interactions in order to better site experiences and tools in the future. I may also use trusted third-party services, such as Google Analytics and Facebook, that tract this information on my behalf. I do not sell, trade or otherwise transfer to outside parties your Personally Identifiable Information unless users are provided with advance notice. (See the cookie banner upon arrival at my site.) This does not include website hosting partners and other parties who assist me in operating my website, conducting my business, or serving my users, so long as those parties agree to keep this information confidential. I may also release information when its release is appropriate to comply with the law, enforce my site policies or protect others’ rights, property or safety. Occasionally, at my discretion, I may include or offer third-party products or services on my website. These third-party sites have separate and independent privacy policies. I therefore have no responsibility or liability for the content and activities of these linked sites. Nonetheless, I seek to protect the integrity of my site and welcome feedback about these sites. I, along with third-party vendors such as Google use first-party cookies (such as Google Analytics cookies) and third-party cookie (such as the DoubleClick cookie) or other third-party identifiers together to compile data regarding user interactions with ad impressions and other ad service functions as they relate to this website. By selecting the Update Preferences link at the bottom of any all emails. I honor Do Not Track signals and Do Not Track, plant cookies or use advertising when a Do Not Track (DNT) browser mechanism is in place. It’s, also imperative to note that I allow third-party behavioral tracking, including but not limited to Google Analytics, MailerLite and Facebook Pixel. When it comes to the collection of personal information from children under the age of 13 years old, the Children’s Online Privacy Protection Act (COPPA) put parents in control. The Federal Trade Commission, United States’ consumer protection agency, enforces the COPPA Rule, which spells out what operators of websites and online services must do to protect children’s privacy and safety online. • I do not specifically market to children under the of age of 13 years old. Third parties, including ad networks or plug-ins may collect PII from children under 13 Fair Information Practices. I will notify the user via in-site notification. I also agree to the Individual Redress Principle which requires that individuals have the right to legally pursue enforceable rights against data collectors and possessors who fail to adhere to the law. The principle requires not only that individuals have enforceable rights against data users, but also that individuals have recourse to courts or government agencies to investigate and/or prosecute non-compliance by data processors. The CAN-SPAM Act is a law that sets rules for commercial email, establishes requirements for commercial messages, gives recipients the right to have emails stopped from being sent to them, and spells out penalties for violations. • Send information, respond to inquiries and/or other requests or questions. • Market to my mailing list or continue to send emails to my clients after the original transaction occurred. Note: Your email address is only collected when you fill out a form or leave a comment on this website. Cookies are used by WordPress (this site’s web host) and plugins that run on this website, including but not limited to Google Analytics, Mailerlite (pop-up), and Facebook Pixel, to personalize your experience on this site as well as to help personalize ads you receive on other sites where ads are already being shown. You can disable cookies in your browser setting to prevent this type of tracking. • Monitor third-party email marketing service for compliance, if one is used. • Honor opt-in/unsubscribe requests quickly. Follow the instructions at the bottom of each email (Manage Preferences|Unsubscribe0, and I will promptly remove you from ALL correspondence. To request your information that this site has collected, please enter your address in the box below, check the box to indicate your agreement, and click submit/send.